Vecta was implemented to improve the operational effectiveness of its sales team and deliver a substantial return on investment. With nearly 30 years’ experience in product, application know-how and customer service, Orbital Fasteners, based in Watford, Hertfordshire, is a leading online and telesales distributor of fixings, fasteners, tools and power tools with a product range that continues to expand, its portfolio now comprises over 27,000 products from 300 different manufacturers. To continue improvement in the operational effectiveness of its sales team and to support its ongoing successful growth, Orbital Fasteners use sales intelligence to present and manage customer and sales information and log calls on their mobile devices, laptops or PCs. 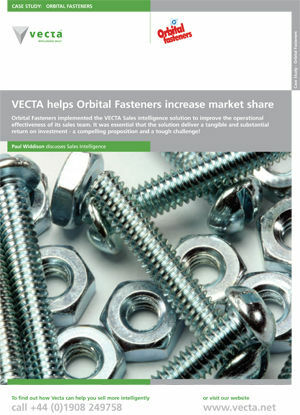 Orbital Fasteners use business technology effectively in order to improve productivity, facilitate controlled sales growth and foster customer retention. With a comprehensive range of products and a substantial customer base Vecta removes the challenge of identifying market trends and customer buying patterns. Vecta helps ensure that Orbital are responsive and agile to changes in spend and customer needs.